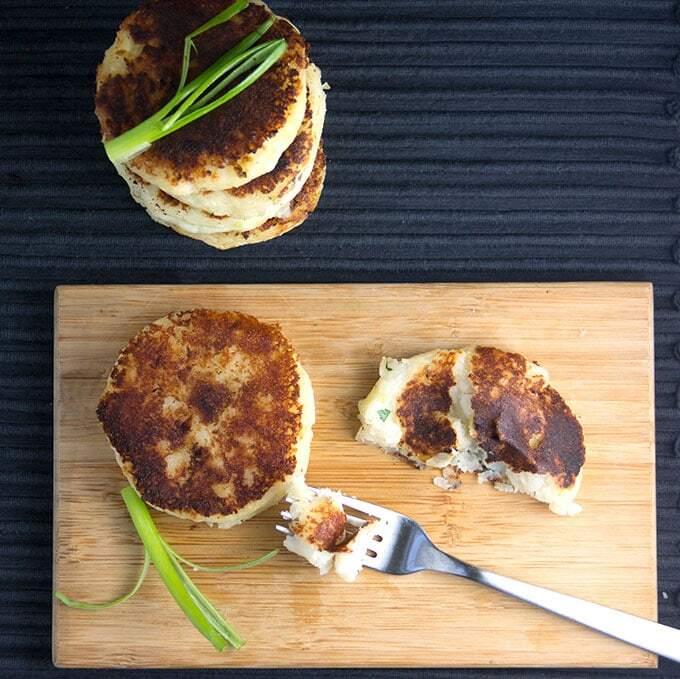 Llapingachos are Ecuadorian potato patties made from mashed potatoes, scallions and cheese. The mixture is formed into a thick pancake and pan-fried until brown and crisp outside, tender inside. Serve them with a fresh tomato avocado salad for a wonderfully satisfying vegetarian lunch or dinner. Add a fried egg on top for even more excitement! In Ecuador they’re called Llapingachos, pronounced (yah-peen-GAH-chos), and you might find them served on their own, as an appetizer. or for breakfast lunch or dinner with a fried egg on top and chorizo sausages on the side. Or they might be slathered with creamy peanut sauce and topped with tomato-onion salad and sliced avocado. The good new is that Llapingachos are already amazing before you even add anything to them. Form the mixture into thick pancakes and cook them on a griddle or skillet until they’re brown and crisp on the outside and tender inside. 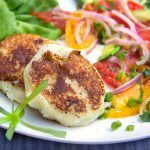 If you like this kind of thing – an oniony potato pancake kind of dish – these Ecuadorian potato patties will win you over! 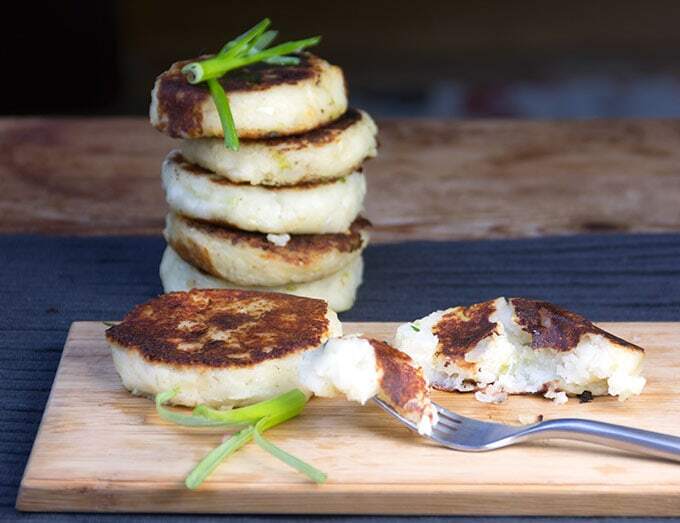 You might enjoy Venezuelan Arepas which have some similarities to Llapingachos. 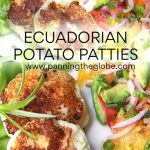 I tested out these Ecuadorian potato patties on my family with tomato avocado onion salad on the side. We all loved the pairing of the potato patties with colorful, juicy tomatoes, red onion, avocado and a light lime-garlic dressing. It was a perfect satisfying vegetarian meal. Having said that, I also sautéed up some sliced spicy chicken sausage for my son, because he’s not a fan of tomatoes. The sausage and Llapingacho combo is also pretty great. Depends on what kind of mood you’re in. I could not have named a single Ecuadorian recipe before researching this post. You don’t hear a lot about Ecuadorian cuisine. Ecuador has other claims to fame: it contains The Galapagos Islands which is one of the worlds best destinations for viewing wildlife; it’s got the equator running through it (hence the name Ecuador). Now that I’ve tried Llapingachos I think it’s definitely a claim to fame that the rest of the world should know about. 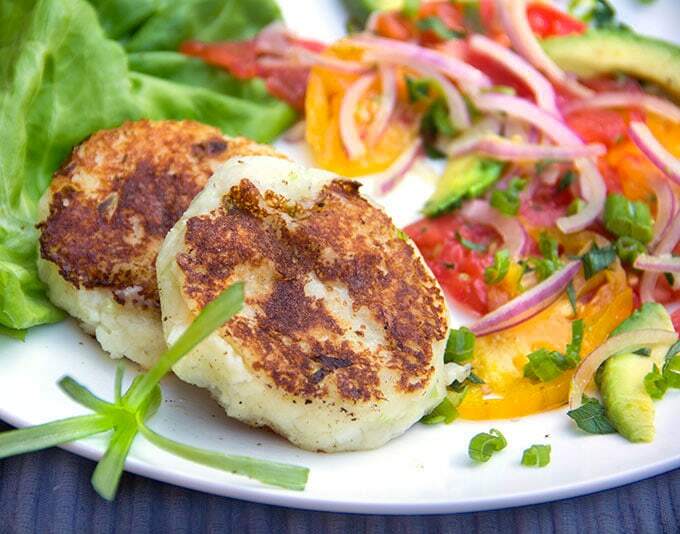 Here’s the recipe for Ecuadorian Cheese and Potato Patties with Tomato Onion Avocado Salad. If you try this recipe please come back to leave a star rating and a comment. I’d love to know what you think! 6–7 green onions, minced, white and light green parts only, mince the dark parts separately to sprinkle on the finished dish. Place potatoes and 2 teaspoons of salt in a large pot and fill with water to cover potatoes. Bring to a boil, reduce to a simmer, and cook for 20 minutes or until tender. Drain and mash with a potato masher. Set aside to cool. Make the Salad While the potatoes are chilling make the salad. In a small bowl whisk oil, lime juice, garlic, a pinch of salt and a few grinds of black pepper. 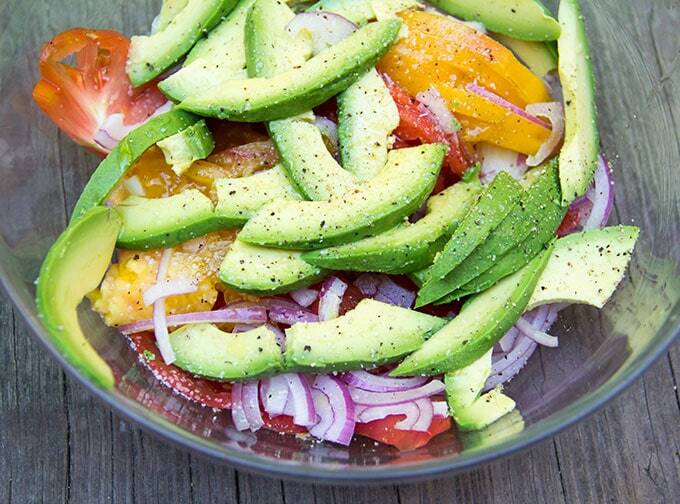 Place tomatoes, avocado, onion and lettuce (if using) in a bowl. Toss gently with dressing. Cook the Patties: Heat a large cast iron or non-stick skillet over medium heat. Add a tablespoon of oil to the pan and swirl to coat. Cook patties in two batches. Let them to brown on one side for 4-5 minutes, then turn and brown on the other side for 3-4 minutes. 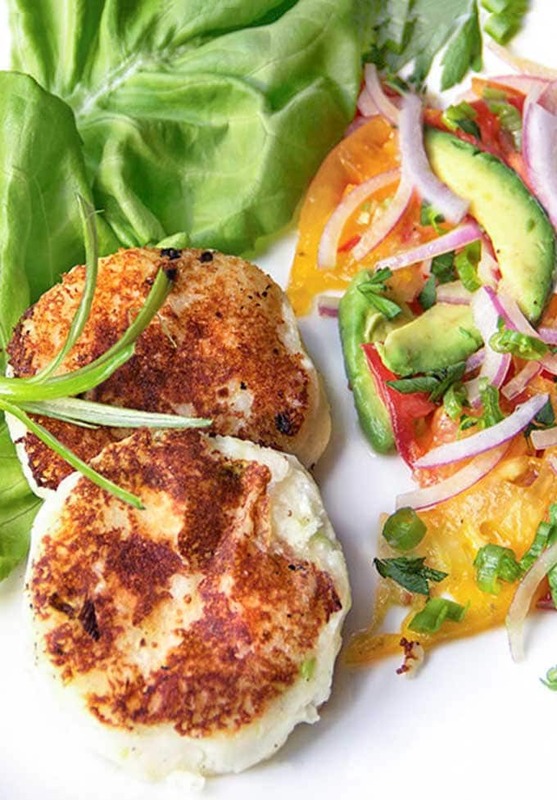 Serve patties with tomato-avocado salad. Sprinkle patties and salad with reserved minced green onions. Thank you so much for this recipe! I used to live in Ecuador and it was my favorite meal there; I legitimately ate it once a week. Where I was living, they made them sans queso, as cheese is rather expensive, and they also refer to them as tortillas de papas (a far easier pronunciation than llapingachos). The entire plato is paired with a simple shredded beet and lettuce salad, cubes of grilled steak, and a fried egg. All for $1.50-$2! If you ever get the chance to visit, I highly recommend! I miss Ecuador often so this recipe is dear to my heart. Thank you!! Glad you told us how to get our tongues around these delicious morsels – Lisa:-) I would have saying them all wrong otherwise! Yum!!! These look so delicious! Perfect for any time of day!!! Thank you, Lisa! !